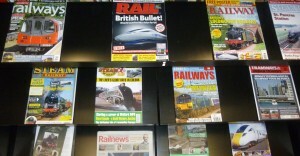 We have a large selection of railway periodicals and newsletters. Some date from the mid nineteenth century up to the present day. They include Backtrack, British Railways Illustrated, Rail, The Railway Magazine,Railway Observer, Steam Days, Steam Railway, Steam World and Today’s Railways. There are also newsletters such as Bulliver, Pines Express, World War II Study Group Bulletin, Track Topics and many more. Should you require a copy of an article we can do that for you. Ideally we would like you to quote the periodical title, date and page number of the article but sometimes the periodical year, title and author of an article is enough. We ask you to sign and return a photocopy declaration form and current costs are £5.00 for up to 4 sheets and further sheets 50p each. We regret that we are unable to accept electronic requests or payments. Cheques payable to Libraries Unlimited please. For a full list of titles click here.